Balwin, South Africa’s largest homebuilder focusing on large scale sectional-title residential estates in high-growth, high-density metropolitan nodes in South Africa’s major cities, this morning announced a solid operational performance for the six months ended 31 August 2016. The Company’s success is based on a continuous development approach – selling 15 to 30 units per location, per month in diverse locations in order to maintain price tension in the market as well retain artisanal expertise across sites. Balwin had 14 developments under construction during the period and constructed 1 033 apartments, in line with its six month forecast at an average selling price of R995,911 per unit. Despite this solid performance in a constrained economic environment, the Group’s operating profit was negatively impacted by a delay in registration transfers. “Operationally our performance was in line with expectations, but the fact that we currently only account for revenue on transfer significantly impacted our results. Balwin listed on 15 October last year and is differentiated from other JSE listed property companies and REITs as its business strategy is underpinned by generating profits through the development and sale of large-scale residential estates. These estates average in size between 500 and 1 000 units and offer buyers secure,affordable, high-quality and environmentally friendly one, two and three bedroom apartments ranging in size from 45m2 to 120m2. “Although the economy is under pressure we have seen a sustained level of demand and rate of bond approvals. Our phased development and finance model does however ensure that we mitigate risk as far as possible during these uncertain economic times,” Brookes explained. Transfer of the first phase in a new development traditionally takes longer than normal to register, due to a more protracted council approval process. Turn-around on subsequent phases are generally more seamless. Grove Lane in Pretoria, where 119 units were affected. All these units had transferred by October 2016. Balwin’s investment proposition is backed by a robust, proven, business model supported by urbanisation and growth of the middle class. The Company mitigates risk by matching construction to pre-sales and rolling out developments over several phases which are financed per phase. During the review period, Balwin acquired the development rights of three substantial land parcels in the growing Waterfall node. This will see Balwin develop approximately 15 500 sectional title residential units in the node over an [eight to ten year] period. 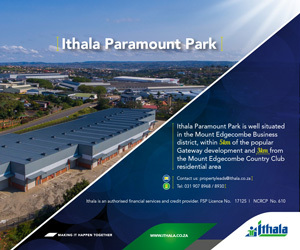 The development rights include three separate land parcels namely, The Polo Fields, Waterfall Fields and Waterfall Ridge which are all located within close proximity to major transport routes, industrial and retail developments including the super-regional Mall of Africa and a planned central business district following the relocation of major corporates. The developments will be complemented by petrol stations, convenience stores and schools to support the residential node. “We are very excited about our upcoming developments in the Waterfall node as it is one of the most desirable areas to be developing in. Demand has been exceptionally strong since we first announced our plans to develop there and we are pleased to report that Polo Fields achieved a record breaking 150 unit sales in August when it was first released for sales,” Brookes added. In line with Balwin’s strategy to continually develop in diverse locations, the Company acquired two new land parcels in the Western Cape during the review period. The first called De Zicht is located in Milnerton and the second called Paarl is located in Paarl. These acquisitions will expand Balwin’s pipeline by a further 2 000 apartments. Balwin is committed to keeping up with international standards and best practise in the design and marketing of its developments. One of Balwin’s unique selling points is its lifestyle centres which offer tenants a full spectrum of all-inclusive value added services including recreation and gym facilities, a restaurant and spa, free wi-fi and concierge. Balwin has received various awards and industry recognition over the years, entrenching it as a national homebuilder of choice targeting the South African middle – income market segment. Most recently, Balwin’s Paardevlei Lifestyle Estate received the ‘highly commended’ award for the Africa region of the International Property Awards 2016 - 2017, in the category ‘Development – Apartment South Africa’. “We are always seeking innovative ways to bring our clients new and exciting offerings. Crystal Lagoons, one of our latest lifestyle additions and the first beach experience of its kind in South Africa will be launched at our River Walk development in Pretoria. It’s set to revolutionise lifestyle estate living!” Brookes concluded. Balwin’s policy is to re-invest 70% of its after tax profits back into the business to support development growth, with the remaining 30% of profits distributed to shareholders. Accordingly, a gross dividend of 11,09 cents per share was declared.